Heavy thunder, lightning and rainfall swept through San Diego County Wednesday, prompting a series of weather warnings across the county, including a rare, brief tornado warning. 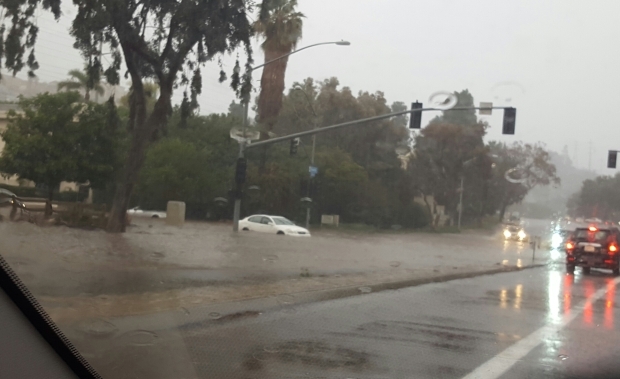 The National Weather Service (NWS) issued a flash flood warning for North San Diego County over the course of afternoon, leading to a series of road closures and flooding. 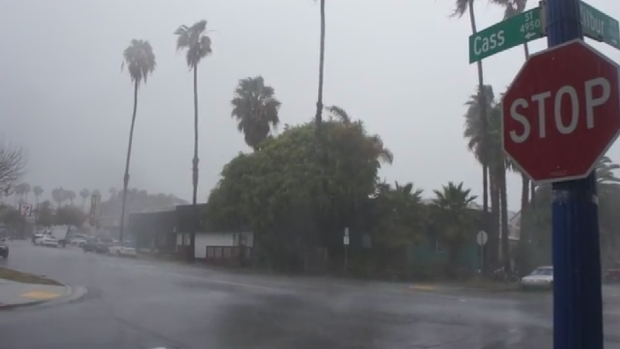 The warning meant heavy rain fell quickly for areas such as Oceanside, Carlsbad, Temecula, Vista, Mission Viejo, Redlands, San Clemente and southern parts of Orange County. A flash flood warning was also issued for parts of south central San Diego County until 6:15 p.m., where thunderstorms dropped heavy rain. Areas affected included Chula Vista, El Cajon, National City, La Mesa, Poway, Imperial Beach, Ramona, COronado, Alpine and North Park. A flash flood watch is still in effect in San Diego County through Thursday morning, in all coastal, valley and mountain areas below 4,500 feet. NBC 7's Candice Nguyen speaks with a car owner who watched as a tree topped onto his car. A brief Tornado Warning was issued from 2:56 p.m. to 3:30 p.m., but it was canceled at 3:20 p.m. by the NWS for west central San Diego County. Areas impacted included University City, La Jolla, Torrey Pines, Sorrento Valley, Del Mar Heights, Carmel Valley and Mira Mesa. A second warning for the Escondido area was also issued at the same time and later canceled. There were no reports of tornadoes spotted. All San Diego Unified District schools were under shelter-in-place orders for a brief period of time during the tornado warning, said SDUSD spokeswoman Linda Zintz. The NWS also issued a severe thunderstorm warning for parts of the North County, which expired at 2 p.m. The warning impacted Oceanside, Carlsbad, Temecula, Vista, Encinitas, Del Mar, Valley Center, Fallbrook, Southern Lake Elsinore and San Clemente. 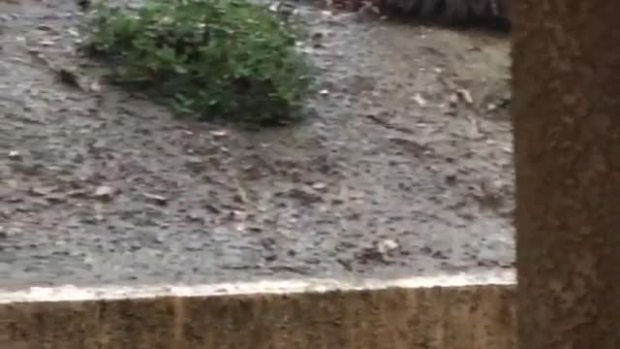 Viewer Layla Mahgoub sent this video from outside the Pacific Gardens apartments in University City. She said the mud and water is building outside of her door. An Aviation Weather Warning was put in place for Lindbergh Field, the NWS said. Thunderstorms with cloud to ground lightning were predicted to move or be over the area within a five mile radius. The warning expired at 5:30 p.m., after which thunderstorms moved out of the area. Travelers were encouraged to check their flights as the storm unfolded. As the severe weather continued across San Diego, San Diego Lifeguards closed the Ocean Beach Pier. Lifeguards will inform the public once it is open again. The largest rainfall totals were expected between 4 p.m. and 10 p.m. Wednesday, with parts of the county seeing between one and three inches of rain. The NWS says a winter storm warning remains in effect for the mountains through Friday morning. This warning brings rising snow levels to mountain regions in Southern California, with heavier snowfall expected Wednesday afternoon through early evening, and again late Wednesday into early Thursday morning. The warning impacts Pine Valley and areas at an elevation above 4,500 feet. The NWS says visibility in the snowy mountains may be compromised, with some areas experiencing blowing snow and fog. Visitors into the mountains should be prepared for hazardous driving conditions and should be equipped with chains for their tires, extra food and warm clothing. A flashlight and extra water should also be kept in one’s vehicle in case of emergency in a snowstorm. NBC 7's Matt Rascon reports from a City Heights street filling up quickly with flood water -- and one driver who got stuck on the other side. Snow will fall high up in the mountains Wednesday, so NBC 7 meteorologist Jodi Kodesh said it's best to wait until later this week to visit the mountains, once visibility and driving conditions have improved and there's more snow in lower, more accessible areas. At noon Wednesday, a flood warning was activated by the NWS for the San Diego River in the Fashion Valley area. The warning says roads impacted by possible flooding include Avenido Del Rio, Camino Del Este, Camino De La Reina and Mission Center and Fashion Valley roads. Parking lots at Fashion Valley mall may be impacted, too, the NWS says. Meanwhile, a wind advisory went into effect Wednesday at noon for the coastline, lasting through 6 p.m.
"Winds of 15 to 25 mph are possible, with gusts to 40 mph. We may see a secondary round of high winds late tonight," Kodesh explained. A high surf advisory also remained in place. Amid current weather conditions, the City of San Diego issued a warning for local park trails Wednesday afternoon, saying residents are urged to use caution at local trails "due to wet and unstable conditions." "Residents should avoid walking, hiking, running or cycling on City park trails during inclement weather conditions to avoid injury. Please check with a park ranger or staff before heading out," the City warned. 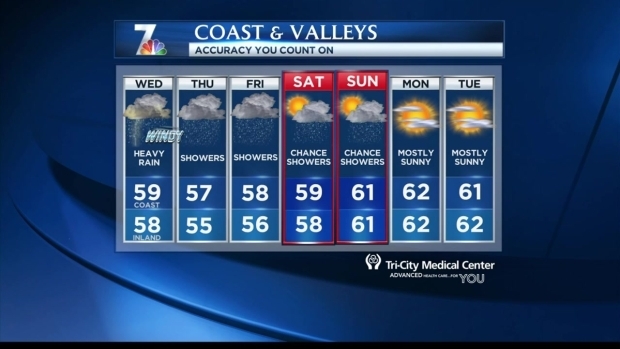 Check back for weather updates on NBC 7 throughout the day or follow NBC7 on Twitter throughout the day for live weather and public safety updates.